One of the pieces in “Something Real,” Carl Marin’s solo exhibition at FLUXspace, is nearly perfect—a complex, multi-component project whose success hinges on the discovery of the performative process at its heart. Left to its strengths, Marin’s work makes powerful statements about the modern human experience of the natural world, but it falters under the weight of too much exposition and indecision in its installation, feeling like the first steps of some of the animals Marin uses in his photographs, videos, and sculptures. Marin set up the first part of “Turkey Blind” (2010) in the windowless ground-floor exhibition area, an industrial slab that he transforms, with a bench facing a single photographic print, into a natural history exhibit. 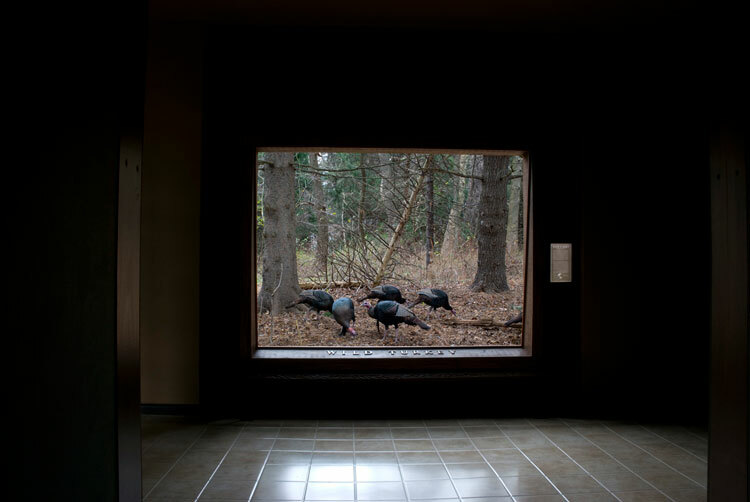 In the image, cool light streams in through a large picture window; on the other side, five wild turkeys peck the ground, posed in a naturalistic diorama. The photograph, like the scene it depicts, is as crisp as autumn, and it draws the viewer into its slick, iridescent inkiness. Although it is a seductive image, Marin has left a couple of clues not to take this idealized nature display at face value. The tail feathers of a sixth turkey are just barely visible at the left edge—this quirky placement doesn’t fit with the design conventions of the natural history diorama, nor with pictorial conventions. A hint of movement among the birds is blurred by the camera. The viewer is rewarded, like a hunter, for close observation with this surprising, gratifying discovery: these are not taxidermied turkeys after all, but the real thing. To get to the upper floor, visitors pass a plaque installed on the wall opposite the photograph. Cast in bronze, the text describes how Marin hunted his photograph by constructing a collapsible turkey blind to conceal himself while following the birds over several days at a nature preserve. The turkey blind that Marin built is installed on the second floor. Instead of the traditional camouflage tent or hut, Marin’s blind is, in fact, the natural history museum display that is seen in the photograph. I missed the plaque on my first time through, and I’m glad; it was more fun to put the pieces of Marin’s process together on my own. The explanatory plaque is the first shaky move in a show that otherwise seems on sure footing, the kind of wasted gesture that translates as doubt in the clarity of the work’s execution. But “Turkey Blind” redeems itself upstairs. In the main exhibition space, the blind is set deep in the room, allowing visitors to walk around the structure and take it in from the photographer’s as well as the subjects’ point of view. The scale is a tremendous surprise. 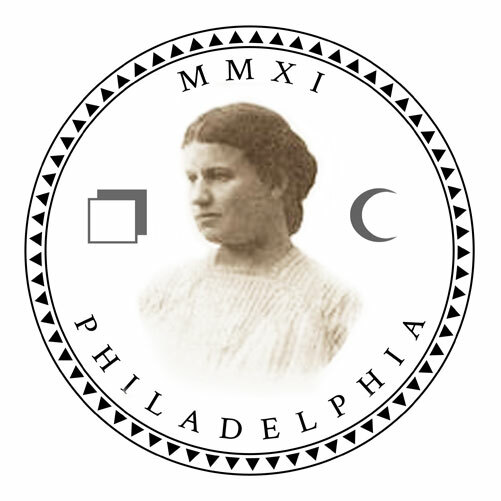 In the photograph, a trick of the camera gives this three-sided box, not much more than 4 feet square, the dimensions of a full-scale museum display. On the blind, the letters spelling out “Wild Turkey” are revealed to be just inches tall; outsized nails show through the “floor” tiles. Everything is in shocking miniature compared with the implied scale of the photograph. The craft is impeccable but the materials are cheap, which is all the better for the rich-looking revelation of the photograph. Breaking the work up into two exhibition stages reveals the conventions and conditions by which we are led to invest ourselves in museums and their truth claims. I felt sucker-punched—in the best way possible—for mistaking this chintzy artificiality for authenticity, a testament to Marin’s deft use of live animals, natural light, and the magic of photography. Raised by a taxidermist, Marin grew up hunting, and his present body of work approximates some of the behaviors and virtues of hunting without taking in a kill. 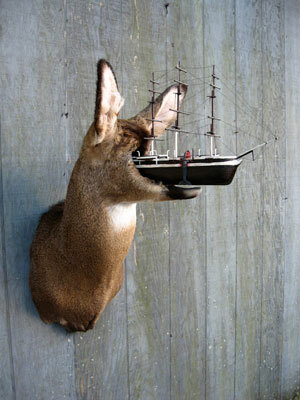 The one exception is “Untitled” (2010), a mounted deer head (a cast-off from his late father’s shop) whose face Marin has replaced with an intricate model of a ship. The show postcard uses this piece without the ship—a vision of destructive emptiness. I preferred this simpler, darker version for its absolute refusal to play by the conventions of taxidermy mounting. In the exhibition space the blind is turned toward “Untitled,” reframing it through the “Wild Turkey” display, which seems to confuse the intention of both of these works. In the next room, a video installation features another hunting blind, this one installed with a projection of a series of stills of wildlife captured by a motion-activated hunting camera. Its inclusion feels tacked on, one image flickering by after another, in an effort to fill more space. Can a solo show contain just one piece? It’s a possibility I wish had been considered. The multi-stage realizations of “Turkey Blind” are satisfying, and the work’s comment on capturing the “manner” of nature and the presence and proliferation of idealizations extends far beyond the natural history diorama. Marin skewers the formal conventions of the taxidermist and the naturalist, as well as the expectations of the museum-goer, but the work is patient, never scolding, and often funny. The “Something Real” of the title might not be the animals, but the paradoxical use of artificiality to get the experience we yearn for.